A podcast by Dr Delva Shamley of the Centre for Clinical Research at UCT on upper limb rehabilitation post breast cancer. 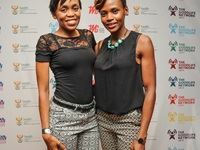 The launch of health and lifestyle channel, The Good Life Network (GLN), on DStv channel 199 at a Switch On event in Melrose Arch, Johannesburg. Resolve Capacity has won the Corporate Innovation Award at the 2015 MyWorld of Tomorrow SA Innovation Awards for its Clinic-in-a-Box, a turnkey infrastructural concept for the rapid deployment and commissioning of a clinic. These prefabricated structures can be erected within less than a day, and contain all the components required to deliver a total solution, packed and ready for delivery in 20 to 40 ft containers. Founder and CEO of Quercus Investment Partners, Diego Biasi, handed over a massive cheque for the first of three tranches - comprising R10m - to Red Cross on Tuesday, 15 September. 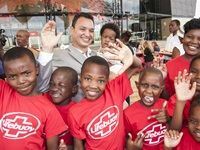 Lifebuoy has reaffirmed its commitment to championing health and hygiene in South Africa at a recent media event held at the Soweto Theatre in Johannesburg. Many a VIP showed up for the PinkDrive, Pink Tie Dinner at Emperors Palace on Saturday evening, 18 October 2014. In a new study appearing in the 9 October 2014 issue of the journal Cell, Yale researchers Brant Webster, Patrick Lusk, and colleagues describe a key quality control mechanism that protects new cells from inheriting defective NPCs. The POLO International Horse Trials kicked off on Friday 3 October with the dressage phase at the Kyalami Equestrian Park, whilst the POLO Pink Pony brunch in aid of Breast Cancer Awareness month was hosted alongside. X-ray computed tomography (CT), also called X-ray microscopy, is a non-destructive technique for visualising interior features within solid objects and for obtaining digital information on their 3-D geometries and properties. The first nanoCT scanner in Africa will be officially launched on 15 September 2014 at Stellenbosch University's Central Analytical Facilities. Dr Ben Roberts talks about how augmented reality might be used to support learning in dentistry.